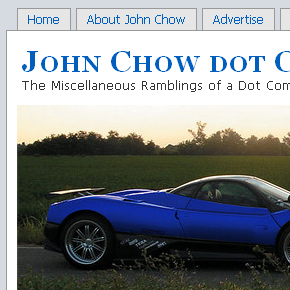 John Chow, of course, is famous for the super cars he features in his banner image. I thought it would be pretty funny to create a banner image featuring my first car: a 1981 Chevrolet Citation! If you didn’t know me then, let me tell you that this car was smoking hot! If they still made this model, I’m sure it would be popular with the Lindsay Lohan / Britney Spears crowd. I’d include some nice pictures showing the interior or perhaps the mean 2.5L L4 under the hood, but unfortunately the vehicle died on us before we owned a digital camera! Funny, you’re 2.5L L4 is bigger than my new vehicle…Sentra 1.8. I think I’d smoke the Citation in a race, however. I remember very well the creamy interior, stereo (which was positioned vertically in the dash) blaring Danzig and Metallica. That stereo (with tape deck) was a huge upgrade over the original AM radio!